My husband has a PhD in synthetic organic chemistry, and as you may guess, that suggests a few things about his personality. He appreciates the reason and predictability of hard science, and enjoys those things in life as well. Personally, I see it as part of my mission in life to help him break out of his box. When I work on a quilt that is so irregular in its design, I love to ask my incredibly supportive, yet symmetry-loving husband how he likes it...and watch him squirm as he tries to figure out what to say, while trying not to hurt my feelings. "Uh, well you know? It's certainly different; um...and colorful; and I mean, it definitely is modern." haha! Is it wrong that I know he won't like it, but ask him his opinion anyway, all while laughing on the inside? Yep. Just hand me my horns and pitchfork now. I did let him off the hook after just a little while, so I'm not completely heartless, but again- my mission. I had so much fun diving into my scrap jars for this one, and I decided to quilt it with all over swirls. I'm going to level with you here. The choice of swirls was because I knew that my swirls still needed some work, and I knew that this crazy design would perfectly hide any imperfect quilting, though I do think they fit the feel of the quilt. 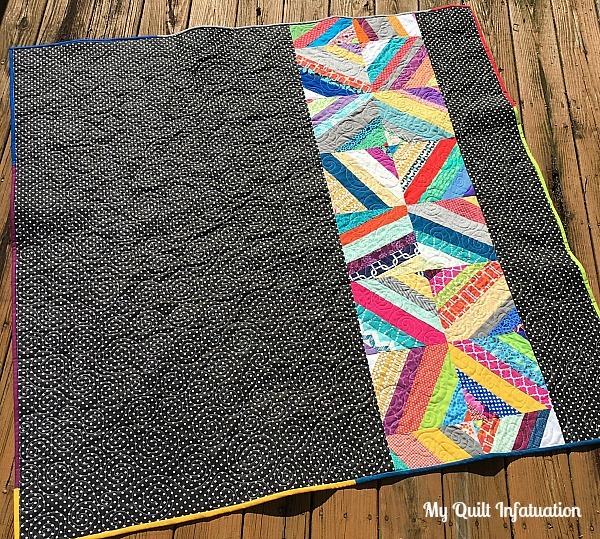 I love black and white prints paired with loud rainbow scraps, so I chose a polkadot for the backing; and in keeping with the spirit of the quilt, leftover binding pieces frame this scrap-happy quilt nicely. After letting my hubby off the hook, he admitted that this quilt was not his cup of tea, and said that he just couldn't look at it. He jokingly said that the asymmetry made his skin crawl, and that lack of symmetry with all of the bright colors could cause Vertigo. I think that's an excellent name for it! The swirls look great! Even if they're a bit wonky, it goes with the Vertigo theme! Love the back, your swirls turned out great! Love it! Front, back and swirls! Love coloring; amazing how everyone's string quilts look different. ha that is funny. I do the same thing to my hubby too. he really hates scrappy with too many colors in it. but I love to ask him anyone. and i love this quilt! a colorful string quilt has been on my list for awhile now. I confess I do the same with my husband who doesn't like bright (loud) fabric...my latest infatuation with Kaffe fabrics really isn't to his liking but he does try to say something nice! hehehehe We're so "mean" to our husbands, aren't we? It sounds as though your husband should be commended for his attempts to be kind. My husband just tells it like he sees it. This has taken some getting used to for a thin skinned woman like me. I've come to learn to appreciate it though. Now, if I could get him to like the same colors, etc... that would be great!! As always, I love the quilt. I have to admit, I'd get a little woozy if I had to look at this one all the time. It'd make a great layering piece though! That's hilarious - Beautiful quilt! I really, really like this one ALOT! This is awesome! Every time I see a quilt like this I think I too should make one with all my scraps. Maybe some day!! Thanks for sharing and great job on all the quilts you make. I love reading your blog. Can you explain how to make the blocks? Would love to give this one a try. Hi Sue! The blocks are super easy. I just used my 8.5 inch square ruler to make sure that my block size stayed pretty consistent. Starting with the middle of the square (because it's the longest point), I sewed strips together, making sure they overlapped the ruler by about an inch on either side. This is important to get the wonky look later. After sewing strips from the center toward one side, I flipped the block around and sewed strips to fill in the other side. Again, overlapping a little bit. Then, I pressed the blocks, and used the square ruler to trim them to size. Here's my trick for making them wonky- when I laid the ruler on top of the block to trim it, I rotated the ruler so that the center strip was NOT perfectly aligned down the middle. Does that make sense? If you need more info, please email me using the button on my sidebar. You are a no-reply blogger, so I can't email you directly back. I am happy to send a few photos through email if you need them. I love, love, love this quilt....but I could never make it. No matter how hard I try I cannot force myself to do anything asymmetrical! I guess I'll just look at yours! My favorite kind of quilt! Love it ! Best Quilt of the Year so far, Kelly. I love everything about it !~! As does my Gypsy husband. Congrats on a bright and fun finish. I'm married to a PhD physicist, so I really get the whole it has to be symmetric thing. There are times he refuses to look at what's up on the design wall because it's "just wrong". I've been searching for a project to use some of my print fabrics, this may be perfect for that! It's gorgeous. I love when husbands say 'interesting', 'not my cup of tea' or 'what is that?' They just don't get it sometimes! Love, Love, Love it! String scap quilts are one of my favorites. Looks great. Will you keep it in the house to torture, I mean, re-train him or send it elsewhere? Love your spiraling quilting. Thanks for linking up with TGIFF @ A Quarter Inch from the Edge!